Sinister forces lurk around you regardless of the world you live in. 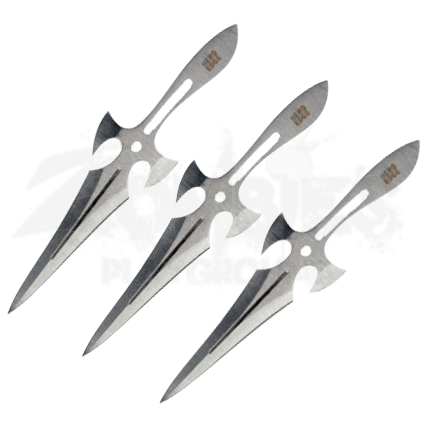 Arm yourself, ready for the darkness that is to come, with the 3 Piece Chrome Triple Strike Throwing Daggers, the perfect survival tool for fantasy and reality! By fusing elements from both modern and fantasy realms, this threatening throwing trio is built from chrome-finished 440 stainless steel in an exquisite silhouette that is anything if not magical. These winged knives host a blade-heavy construction with cutouts on the handle to enhance precision and rotation for when the blade is thrown. Stow this set of throwing daggers in the hardy nylon sheath to have them on hand when the situation demands it. 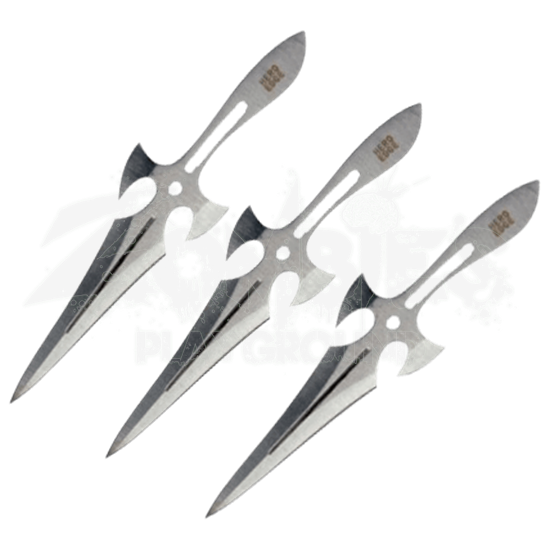 Whether for personal practice, a throwing competition, or surviving an invasion, the 3 Piece Chrome Triple Strike Throwing Daggers is the survival tool that can do it all!